The Vuelta a Espana has a reputation as a revenge race for riders that have had little success in the first part of the season, mainly in the Tour de France. Vincenzo Nibali, Joaquim Rodriguez, Domenico Pozzovivo and Tejay van Garderen are looking for redemption after their disappointments earlier in the year but this year the Spanish grand tour is more than a race for the losers. Chris Froome is the first rider since Carlos Sastre to chase the Tour-Vuelta double and with the Movistar duo of Alejandro Valverde and Nairo Quintana and the Astana pair of Mikel Landa and Fabio Aru all trying to continue their run of success, race director Javier Guillen has had a hard time believing the formidable start list that will make the third grand tour highly contested. CyclingQuotes.com takes a thorough look at this year's favourites and outsiders and finds out all about their strengths and weaknesses. With its position at the end of the season, the Vuelta a Espana has always been different from the Giro d’Italia and the Tour de France. While the first two grand tours are the big objectives for most riders, the Spanish race is often the chance for redemption and many riders usually make a late decision whether to do the race. Often that has led to less spectacular start lists and less motivated riders, with many using the race to prepare for the World Championships. However, things have changed and for the last two years the race has had a much stronger field than the Giro. Last year it was the misfortune of Alberto Contador and Chris Froome that suddenly meant that the race could boast no less than three riders from the Fabulous Four in addition to a huge talent like Fabio Aru and the usual veterans Joaquim Rodriguez and Alejandro Valverde. After Nairo Quintana had crashed out of the race and Chris Froome had slowly ridden himself into form, it came down to a thrilling battle between Froome and Contador in a match that allowed us to get what we never got in France during the summer. Race director Javier Guillen must still be pinching himself to see if he is dreaming as this year’s field is maybe even stronger. Unlike last year, all the big favourites completed the Tour but they have not had enough racing yet. While Vincenzo Nibali will be looking for redemption on Spanish roads and Nairo Quintana has always planned to do the Vuelta, Chris Froome has made a late decision to try to become the first rider to win the Tour-Vuelta double since the Spanish race was moved to its current autumn slot. Only Alberto Contador who also did the Giro, has put an end to the season as even not the Tinkoff-Saxo captain has been inspired by team owner Oleg Tinkov’s dreams of a grand tour treble. As usual veterans Joaquim Rodriguez and Alejandro Valverde will try to continue their love affair with the Spanish grand tour after hugely different Tours that saw the former fade and the latter achieve the biggest goal in the remaining part of his career. Fabio Aru and Mikel Landa will again team up after they so successfully finished on the podium in the Giro and with Nibali and most of the formidable Giro squad at their side, they will be ready to go for grand tour glory for Astana. Tejay van Garderen saw his podium dreams fade away when he was struck by illness in the Alps and is now looking for revenge in Spain. The same goes for compatriot Andrew Talansky who had a disappointing Tour while Domenico Pozzovivo will try to turn his fortunes around after he crashed out of the Giro. Add the veterans Samuel Sanchez and Frank Schleck, huge talents Sergio Henao, Joe Dombrowski, Rafal Majka and Esteban Chaves and consistent grand tour contenders like Pierre Rolland, Daniel Martin, Daniel Navarro and Daniel Moreno to the list and you have the recipe for three weeks of excellent racing in Spain. CyclingQuotes.com has taken an in-depth look at the race's favourites, assigning 5 stars to the race's biggest favourite, 4 to his two biggest rivals, 3 to three other potential winners, 2 to four of the podium contenders and 1 to 5 of the race's minor outsiders. In this article, we take a look at the 3-star riders who may be seen as outside bets for the overall win. For years, Italy has been looking for the next great climber after the late Marco Pantani. Ivan Basso and Riccardo Ricco both showed the potential to emulate the national hero but after they both got embroiled in doping scandals, they never returned to their former level. Vincenzo Nibali may have emerged as their greatest GC rider for years but the Italian is a much more complete rider and definitely not the kind of climber that makes him comparable to Pantani. In 2014 the Italians went crazy. On May 25, a skinny Italian climber emulated Pantani by taking a huge solo win on the climb to Montecampione in a stage that had been dedicated to the late Italian. On that day, Fabio Aru rode away from the likes of Nairo Quintana, Rigoberto Uran, Domenico Pozzovivo and Rafal Majka and went from hugely promising talent to established star. Suddenly, Aru carried the weight of the entire home nation on his shoulder which is an arduous affair for a 23-year-old rider. However, he coped with the pressure and went on to nearly beat Quintana in a hugely exciting drama on the Monte Grappa where the crucial mountain time trial virtually decided the race. 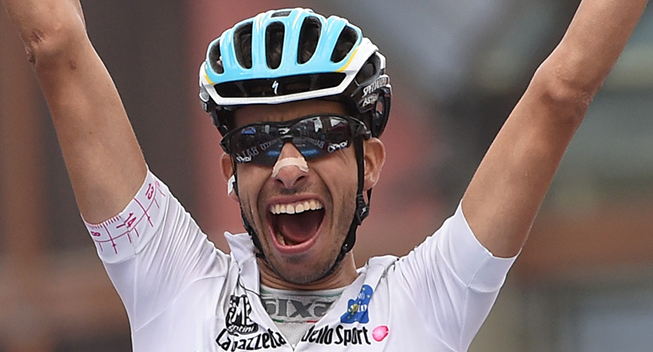 On that day, Aru moved himself firmly onto the podium and despite a less than stellar ride up the Monte Zoncolan in the penultimate stage, he ended his first grand tour as team leader on the podium. On paper, that third place may be his best result but it was probably his performances later in the year at the Vuelta a Espana that really proved his potential. In that race he found himself up against much better riders as Chris Froome, Alberto Contador, Alejandro Valverde and Joaquim Rodriguez were all part of a formidable line-up. However, Aru was unfazed by the prospect of riding against some of the best climbers in the race and he left the race with two big stage victories in the mountains and a great fifth place behind the four giants. The result marked another step forward and he continued his progress in this year’s Giro. For the first time ever, he went into a three-week race as one of the pre-race favourites and he confirmed that he has the mental strength to cope with the pressure of bearing the weight of the home nation in the Giro. After a great start that briefly allowed him to take the race lead, he suffered a big drop in form in the second half of the race and looked like he could potentially fade out of podium contention. However, he showed a remarkable fighting attitude by limiting his losses and by winning the final two mountain stages and move into second overall he confirmed that he has both the mental and physical strength to win a grand tour. Earlier in the year Aru briefly played with the idea of getting a first taste of the Tour de France where he would ride in service of Vincenzo Nibali. However, those plans were quickly abandoned and instead Aru turned his focus to the Vuelta where he would get a chance to ride for himself. With the sudden emergence of Mikel Landa, there was no guaranteed captaincy role but alongside his Basque teammate he was set to pose a formidable two-pronged attack. However, the internal Astana hierarchy has been made more complicated by the addition of Nibali to the equation. For the first time since the 2013 Il Lombardia, the pair will line up as Astana teammates for a UCI race and it is no secret that they have had a hard time finding room for both of them in the team. Nibali had done nothing to hide that he wanted to do the Giro this year but his team asked him to focus on the Tour to give Aru a chance to shine. However, if they can handle their internal rivalries better than they did at the Giro where Aru was clearly given preferential treatment by the team management despite Landa being the only real threat to Contador, the addition of Nibali will give the team a great chance to make a surprise. On paper, Quintana and Froome are the superior climbers but with a three-pronged attack and a formidable team that completely dominated the Giro to support them, they have the tactical weapons that will allow them to overcome the challenges. Due to his versatility and his past performances, Nibali stands out as their best card but Aru will be able to benefit if the rivals are more focused on the multiple grand tour winner. Until he faded in the middle part of the race, he proved that he could match Contador in the Giro mountains and last year he was not far off the best in the Vuelta. At just 25 years of age, there is still room for improvement and nobody knows if Aru has already added another level to what he showed in the Giro. For such a young rider, it is a massive task to go for GC in two grand tours in the same year but in 2014 he proved that he can handle the challenge. In fact he was maybe even stronger and more consistent in the Vuelta, suggesting that his excellent ability will bring him far. Furthermore, he has the benefit of not having done the Tour which should leave him a lot fresher than Froome, Quintana and Nibali. This has also allowed him to have a much better build-up with his usual high-altitude training camp putting in the perfect position to strike. Everything seems to go in the right direction for Aru who made his return to competition in the Tour de Pologne. Last year he was far off the pace on the Polish climbs but this year he was probably the second best climber behind Sergio Henao. Since then he has condition will only have improved and he should be a lot stronger when we get to the mountains in the second part of the race. However, Aru has a few chinks in his armour. First of all there is the challenge of almost 40km of completely flat time trialling. The individual discipline has always been a weak point for Aru and there is no doubt that he will lose a considerable amount of time to Froome and Nibali on stage 17. This year he suffered a big loss to Contador in the Giro TT and that course suited him a lot better. On the other hand, he has clearly improved a lot and he recently did the time trial of his life on a completely flat power course in Poland. Secondly, there’s the matter of consistency. Due to his excellent fighting skills, Aru has always been able to avoid disaster but his performances in the grand tours have still been rather irregular. In the 2013 Giro, he alternated between good and bad days. He was on top in the Monte Grappa TT but one day later he suffered on the Zoncolan. In the Giro, he was riding really poorly in the second half until he bounced back in the very end. He still needs to prove that he can keep his top level for consecutive days in the mountains which will be important in a race where the five most important stages come in within just 8 days in the middle part of the race. Then there’s the wind. Aru is not tailor-made for the hard fight for position and the Vuelta always has some crosswinds at some point. While Astana are very strong on the climbs, they don’t have the best team for the flat stages and this is a place where the Italian can be put under pressure – unlike Nibali who is much stronger in those conditions. Finally, there’s the design of the course. One of Aru’s advantages is his freshness and so he will be frustrated that the third week is pretty easy. This is where Froome usually fade and where Aru would be able to make a difference. Now he needs to do the damage earlier in the race and that will definitely be harder. Aru’s biggest asset is his team. Astana have the potential to crush the opposition and if the Sky riders are not at their best, the biggest rivals can be isolated early in the mountain stages. Astana have cards to play and will be able to attack in turns. Aru has proved that he has the right aggressive nature and the ability to find the right moments to surprise the favourites and Froome and Quintana may be more focused on each other. This could allow Aru to gain unexpected time and if he can do another time trial like he did in Poland, it won’t be impossible for him to come out on top. In a direct battle against the best riders, it will be hard for him to win but with the advantage of a team with strength in numbers and a much better preparation, it, Aru could be the second rider from the magical 1990 generation to win a grand tour already at this year’s Vuelta. Sometimes things fall into place when you expect it the least. For years, Alejandro Valverde has desperately tried to get onto the Tour de France podium and he has never done anything to hide that a top 3 spot in Paris would be the crowning achievement of one of the most glorious careers in the current generation. However, an extreme amount of bad luck coupled with a few missed editions due to a doping suspension meant that it seemed like he would never achieve that elusive goal. With the emergence of Nairo Quintana as a possible Tour de France winner, it was evident that time was running out for Valverde. Movistar manage Eusebio Unzue has always been extremely loyal towards his main star but with Father Age slowly catching up with the Spaniard, he had to focus on the long-term future of the team. Nonetheless, he persuaded the sponsors to give Valverde one final chance to achieve his goal by sending Quintana to last year’s Giro and give Valverde another captaincy role. It was heartbreaking to see how a guaranteed podium spot suddenly disappeared when he faded dramatically in the third week and when he ended the race in fourth, it looked like he had missed the final opportunity. For the 2015 Tour, it was impossible to hold Quintana back. Nonetheless, Valverde refused to give up and decided to do the Tour in a lieutenant role instead of going to the Giro which had looked like the original plan. When it was least expected, things suddenly came together for Valverde in the 2015 Tour. Despite going into the race as a domestique and so barely mentioned as a podium contender, he ended the race in third place. Unlike last year when his fourth place was partly due to the absence of Quintana, Froome and Contador he even managed to beat two of the riders from the Fabulous Four as he ended the race ahead of both Nibali and Contador. The result shows that Valverde may have planned his Tour campaigns wrong for several years. Knowing that he was unlikely to be in podium contention, the team deliberately planned that he would not be at his best at the start of the race. Instead, it was important to ride himself into condition during the race to have something left for the Vuelta which would be his big grand tour goal. However, that approach already paid dividends in the French race. With relatively poor performances on the Mur du Huy and the Mur de Bretagne, it was evident that he was indeed far from his best level but that was not a major issue in a part of the race where teams were more important than personal strength. When it was time for the race to get decided in the mountains, Valverde was at his peak and unlike last year the new approach allowed him to maintain his high level all the way to the end. As usual, Valverde will now try to carry his Tour form into the Vuelta. The Spaniard has done the Tour-Vuelta double whenever he has had the possibility to do so. It is well-known that it is a very hard challenge that only a select few have mastered but Valverde is simply a specialist in this matter. While most other riders have faded in the Spanish grand tour, that has never happened to Valverde. In fact he has been in the top 5 every year since he first emerged as a grand tour contender in 2003 apart from 2005 when he missed the race due to injury, 2007 when he skipped the race and 2010 and 2011 when he was sidelined due to suspension. That’s a remarkable feat that is made even more impressive that his top 5 results came on the back of successful Tours in 2006, 2008, 2012, 2013 and 2014. Valverde’s ability to shine in his home race is no big surprise. Probably one of the most talented riders of his generation, the Spaniard doesn’t need an awful lot of training to be competitive and this has seen him become one of the most consistent riders in the world. Valverde is simply riding for victory from his first races in Mallorca in early February until he draws the curtain on his season in Il Lombardia in late September. Valverde is competitive in every kind of race and even when he decides to do a race on the cobbles, he is in the mix. That kind of consistency is a massive advantage in the Vuelta which is very different from the first two grand tours. In the Spanish race, it is much more a matter of survival and fatigue plays a huge role. Even the best riders are usually struggling to reach their usual level at this point of the season. However, the ever-consistent Valverde is never too far from his best level and this has allowed him to shine in his home race. Furthermore, the Vuelta is clearly the grand tour that suits him the best. The Giro could be a good fit for him too but with his big focus on the Tour and the Vuelta being his home race, he has never done the Italian race. Compared to the French climbs, the Spanish mountains are a lot steeper, shorter and less regular. That’s perfect for an explosive rider like Valverde who is not a pure climber. While he has always suffered on the very long ascents, especially at altitude, he has achieved lots of stage wins on the short, steep climbs in his home country. Furthermore, the Vuelta has always had less time trialling than the Tour and even though he is definitely not a bad time triallist, he has always had a hard time against the most complete riders in the Tour. This year Valverde is of course back in the Vuelta as he aims to win the race for a second time. Like in the Tour, he will line up alongside Quintana and it has always been the plan for the two stars to again combine forces in a grand tour. However, their roles are slightly different compared to the situation in France. However, the roles are slightly different this time around. In the Tour, Quintana was the undisputed captain of the team and it was clear right from the start that Valverde will be the plan B. In the end, they came away with two podium places but the plan was always to win the race with Quintana. In the Vuelta, the two leaders are more on an equal footing. In the past, Valverde has proved that no one is better than doing the Tour-Vuelta double than him and so the team has lots of guarantees by having their Spanish star on the roster. For Quintana, this is a completely new challenge. He has never done two grand tours in a single season and the massive task of the Tour-Vuelta double is a lot harder than what he tried last year. Twelve months ago he won the Giro and was on track for a successful Vuelta until he crashed two days in a row and was forced to leave the race at the midpoint. Hence, no one knows how he will handle the strains of six weeks of grand tour racing and so the team has made the wise decision not to focus everything on Quintana in their home race which is extremely important. That also makes it a different situation compared to last year when Quintana was the clear leader at the Vuelta. Valverde willingly sacrificed himself for his captain in the first mountain stage but surprisingly turned out to be stronger than the Colombian and ended up winning the stage. When Quintana crashed out of the race, Valverde took full leadership and ended the race in third to make it three podiums in a row in the Spanish race. However, that performance is also very indicative of what we can expect from Valverde. While Froome, Quintana and Nibali all find themselves in untested territory and at least one of them is likely to fade at the end of the race, Valverde is a guarantee. Barring accident, he seems to be destined to finish in the top 3. However, the victory is a completely different matter and even though Valverde is the Vuelta master, it is definitely no coincidence that he has only won the race once. Valverde is simply not a born grand tour rider. He is a great climber, has learnt how to defend himself in the time trials and no longer has the bad days that plagued him in the past. However, he is simply not climbing at the same level as the likes of Froome, Quintana and Nibali and so they all need to fade or he needs to find time elsewhere if he wants to come out on top. However, Valverde has a few opportunities to do so. The first week is loaded with puncheur finales that are tailor-made for him. He will regret the presence of Peter Sagan who can challenge him in those stages but there should be a significant amount of bonus seconds waiting for Valverde in the first week. Compared to the likes of Quintana, Aru and Landa, he is a much better time triallist and he is more or less on an equal footing with Nibali. If Froome is not at 100%, Valverde has a chance to gain some time on the pure climbers and he is climbing well enough to defend that position. Furthermore, the presence of Quintana is a definite advantage for Valverde. Froome will be more worried about Quintana and may give more freedom to the Spaniard. There is no doubt that Astana plan to blow the race to pieces and in this race Valverde will be willing to take more risks than he did in the Tour where he was desperately focused on the podium. In the Vuelta, he is going for the win so if Astana attack from afar, he will be ready to be part of the action. That could put Sky on the defensive and Valverde will be ready to benefit from that. Finally, Valverde should benefit from his new approach to the season. With his slower build-up to the Tour, the plan was to leave him fresher for the Vuelta and that should pay dividends now. While the other former grand tour winners could all fade, there is very little chance that Valverde will not put together another extremely consistent performance. Barring accident, it is hard to imagine that he won’t end the race in the top 5 and if things come together, it won’t be impossible for Mister Vuelta to win crown his best season yet with another Vuelta victory. It rarely happens that a rider manages to finish on the podium of a grand tour without having been close to a top result in a three-week race in the past. Nonetheless, that’s what happened in this year’s Giro d’Italia when Mikel Landa – who had not even been in the top 10 in a WorldTour stage race before – finished a very surprising third in the race. In fact, more support from his team would maybe have allowed him to take the overall win when Alberto Contador suddenly showed signs of weakness on the Colle de Finestre in the penultimate stage. Even though the achievement can be regarded as the surprise of the year, it didn’t come from nowhere. Since he finished fifth in the 2010 Tour de l’Avenir in 2010, it has been evident that Landa has been a very gifted climber. Unlike other riders, he has not had a meteoric rise in the pro ranks and instead his progression has been a lot steadier. On certain occasions, he has proved his extreme potential but a lack of consistency has made it difficult for him to achieve success in stage races. It is hard to forget how an unstoppable Landa suddenly came out of nowhere to win the Vuelta a Burgos queen stage in his debut year as a professional in 2011 when he wore the orange Euskaltel jersey. It was a perfect example of his inconsistency as it almost looked like a one-hit wonder. He showed signs of life on certain occasions in 2012 but during his first two years on the pro scene he only hit that excellent level once. Things got better in 2013 when he finished 6th overall in Burgos and 2nd in the Vuelta a Asturias and for the first time ever he proved to be competitive at the WorldTour level too. He finished an excellent sixth in San Sebastian and delivered a few good rides in the mountains in his second Vuelta. However, again he was hugely inconsistent as he had both good and bad days in the three-week race. Landa joined Astana for the 2014 season but it didn’t change his inconsistency. He took a remarkable stage win in the Giro del Trentino which suddenly marked him out as an outsider for the Giro. However, it was again an inconsistent ride in Italy as he delivered a few good performances – most notably in the epic stage to Val Martell – but was far from his best on other days. Later he did his best ever grand tour when he finished 28th in the Vuelta. It was this kind of inconsistency that made us write him off as a GC contender for the Giro. He took a fantastic stage win in the Vuelta al Pais Vasco – after another inconsistent performance – and looked extremely strong when he was second behind Porte in the Giro del Trentino which is the traditional warm-up race. However, for once there was not a single bad day for Landa during the three weeks in Italy and there is no doubt that he was the best climber in the race in the final two weeks. It is a bit of a surprise that the 2015 season would be the year of his breakthrough. In fact, Landa had a very difficult pre-season as he was suffering from mononucleosis. He missed the Astana training camps in the early part of the year and made a delayed season debut in Catalonia before he went on to take that first win in Pais Vasco. Now Landa will target more grand tour success in the Vuelta. For a rider who has only been in GC contention in a three-week race once, it is about one thing: confirmation. It is very easy to write him off as a one-hit wonder if he fails to prove that he can do it all again. Hence, there is a considerable amount on pressure on Landa’s shoulders, especially as he is looking for a new team for next season. Another top performance will increase his value significantly and put him in a lot better position if he hasn’t signed a contract yet. However, things suggest that Landa is having a harder time than he had when he lined up for the Giro. Bak then, he had shown excellent condition in the Giro del Trentino but things are completely different now. Unlike in May, he has prepared himself at altitude and when he returned to racing in San Sebastian, he was far off the pace. That was less of a concern as he rode an aggressive race but he was less pleased with his performance in Burgos. He was dropped by his team in the team time trial and even went down in a crash later in that stage. In the final stages, he worked as a domestique but it was evident that he was not in the same condition as he was when he finished second behind Porte in Trentino. Landa has openly admitted that he had expected to be better in Burgos and he had expected to have better feelings at this point. He decided to skip another stint at altitude and has finalized his preparations at home. It remains to be seen whether that approach has paid off but unlike his teammate Fabio Aru who was very strong in Poland, Landa has not had the confirmation that he was looking for. That could put proved to be a challenge for Landa as one of his important fight in Spain is about his position in the Astana hierarchy. With three leaders in the team, it will be important to show his teammates that he is ready to go for glory. If he is off the pace in the first week, he could very well find himself at the bottom of the hierarchy and this could end his personal aspirations. Furthermore, there is no doubt that the management will prefer Nibali or Aru to win the race. It is no secret that Landa will leave the team at the end of the year – he is likely to join Sky or Movistar – and already in the Giro it was evident that Aru was given preferential treatment. Furthermore, Landa has another challenge. The long, flat time trial in Burgos is a big disadvantage for the Basque who has never worked much on his time trialling. As said, he has never really been a stage race contender before so it has never been a goal for him to improve his TT skills. That has obviously changed since the Giro but there is no chance that he won’t lose time to all his rivals in the probably windy test in Burgos. In the Giro, he lost four minutes to Contador in the long time trial. This course suits him a lot less and as Froome is a better time triallist than Contador, Landa could lose even more time here even though the stage is shorter. Landa has to make up for that in the mountains and this requires him to ride aggressively. In that sense, it is a definite advantage that he is part of a strong team with three potential winners. His rivals will probably be more concerned with Aru and Nibali and this could give Landa the room to take more risks. In the Giro, he was climbing better than Contador and so he should not be too far off the mark of Quintana and Froome who are unlikely to be at their Tour de France level. If he has his Giro legs, it won’t be impossible for Landa to challenge the best on the climbs in the Vuelta. Nonetheless, it will be hard for him to win the race. The time trial will be a huge setback that will be almost insurmountable. In the Giro, he was only up against one big rival but in the Vuelta, the number of potential winners is a lot bigger. It will be very difficult for him to gain time on all his rivals, especially if Astana prefer Nibali or Aru to win the race. If one adds the fact that Landa hasn’t shown great condition recently and has only been riding consistently once in his career, a breakthrough victory will be a big surprise. However, less may be enough for Landa. At this point in his career, it is more about confirmation and proving to his future team that he deserves a leadership role. Movistar and Astana will provide him with the foundations to work on his time trialling and so make him a more complete rider. At the moment, the most important thing is show consistency and a return to his excellent Giro level and the Vuelta provides him with the perfect chance to do so.